In this tutorial, we will review the basic sound generator components through the creation of a program. We will investigate only a tiny part of the features of the Korg M3. The following information is therefore incomplete, for example, all the sampling, karma, sequencing possibilities are not discussed. The objective is to keep this tutorial understandable by beginners. 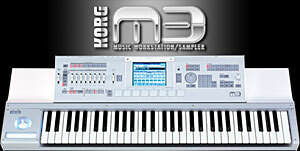 It is assumed that you have a basic knowledge of the Korg M3. If not, I recommend that you look at your quick start manual and/or the operating manual. This tutorial focuses on sound generation; therefore we will use the program mode. Listening to the different available preset programs illustrates all the possibilities of the Korg M3. It ranges from nice reproduction of existing instruments (pianos, flute, etc.) to very complex time evolving pads and other synthetic sounds. Whatever the program you are listening to, the sound generation process uses a few basic elements: oscillators, filters, LFO, Amp, etc. This first tutorial aims to help you discover and experiment with these elements. Notice that these elements are common to most synthesizers (software and hardware), so you may experiment with other sound machines. This tutorial only aims to help you discover the Korg M3 sound generator structure and its basic elements. Next tutorials will be devoted to step-by-step sound synthesis. The following picture illustrates the structure of the main Korg M3 sound generator components. 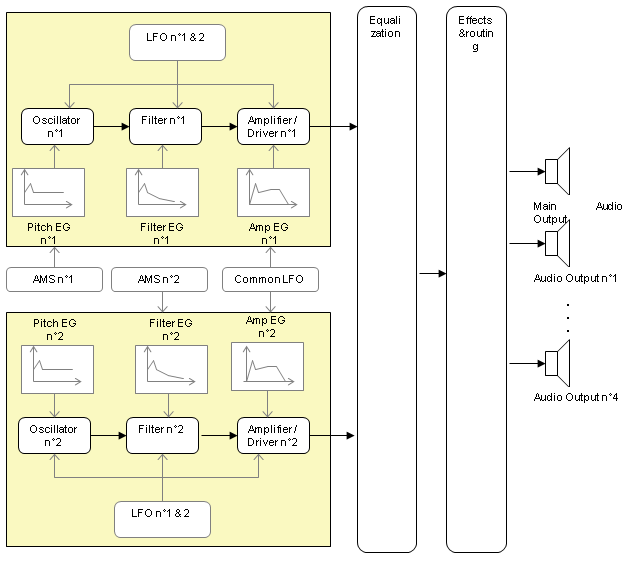 All the components drawn in black (oscillators, filters, amplifier) affect the audio signals. All the components drawn in gray (LFOs, AMS, and the Pitch, Filter, and Amplifier Enveloppe Generators) are only used to modify different parameters through time. Each oscillator is associated with its own filters, LFOs, amplifiers, etc. All these components have been grouped in the “yellow” frame on the picture. In order to follow this tutorial, we will start with an “empty” program. I assume that you have the XPanded extention already set up on your Korg M3. If not, I suggest that you download and install it. Please refer to the Korg website for more info. First, go to the “Program” mode by pressing the “Prog” button located on the upper right side of your M3 screen. Normally, if you have not downloaded any extra programs on your M3, the user bank G should be empty. Select the first program of this bank: “User-G001 : InitProgUG001”, or any other initialized program, indicated by the name "InitProg". To start the explanation of this first tutorial we are going to create a program. Important: you can save you work at any time by clicking on the “down arrow” located in the upper right part of the screen and selecting the “Write Program” option. A sample played is basically a pre-recorded audio file. The Korg M3 is fitted with a lot of samples covering a very wide range of instruments, from piano to flutes, violins, synths, etc. and you can import your own samples. Why does the Korg M3 have two oscillators rather than one? First, it allows stacking of different sounds on a single note. Listen at the program “U-C042 BPM Gating Voice Pad” recorded on the audio file below. The first note is played with a single oscillator, a nice pad is heard. The second sound is the original program with two oscillators. You can hear the nice pad together with a second layer of sound which produces a kind of “bouncing echoes” effect. Second using two of them rather than one allows producing richer, fatter sounds. We are going to experiment with this a little bit. 1) First hit the “Page Select” button located just below the dial. Then select “P1 Basic/DT/Ctrls”. 2) Ensure that the “Program Basic” tab is selected in the lower part of the screen. In the “Oscillator Mode” tab select “double” to use two oscillators for this program. 3) Hit the “Page Select” button and then select the “P2 OSC/Pitch” page. Look at the bottom of the screen, the “OSC1 Basic” tab should be selected. 4) The sample used by the default program is “0000: Acoustic Piano mp –L”. We are going to change this. Hit the arrow just located at the left of this sample and select the “Single Wave” tab, and then the “0658: Saw” sample. Then in the bottom part of the screen, enter -0006 in the “Tune” editbox. 5) Now we are going to assign the same sample to the second oscillator. At the bottom of the screen, hit the “OSC2 Basic”. Assign the same sample (“0658: Saw” from the “Single Wave” category) and enter +0006 in the “Tune” editbox at the bottom of the screen. Now play a few notes on the keyboard. The sound is not really finished, but you can still hear the difference between single and dual oscillators: Press the red square just below the “0658 : Saw” label. It allows switching the oscillator On and Off. On this file (one vs two oscillators), I’ve recorded a C4 with a single oscillator, then with both oscillators. Your can clearly hear the difference. The second oscillator adds more “brilliance” and richness to the sound. 6) Finally, ensure that the second oscillator is switched off. Filters are used to remove some frequencies of the signal. (If you are not familiar with frequency spectrums, I suggest you look at our tutorial here). 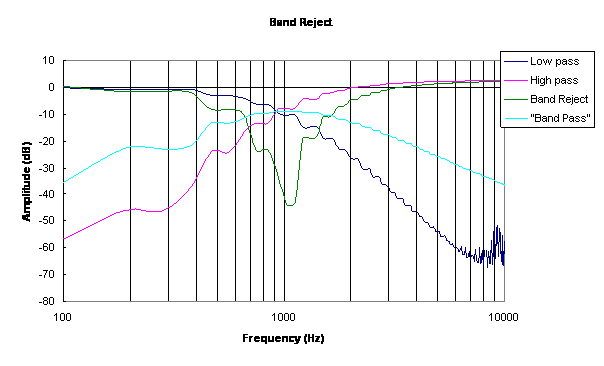 Each filter can be set to one of four types: low pass, high pass, band pass or band reject. This filter is used to remove some or all of the “high” frequency components of the sound. All the frequencies below the filter's frequency setting (the “cut off” frequency) are not modified by this filter. All the components above this “cut off” frequency are attenuated. 1)Hit the “Page Select” button and select the “P3-1 Filter 1” page. This page allows for adjusting the settings of the filter that receives data from the first oscillator. 2)In the “Filter A” section, ensure that “low pass” is selected as the oscillator type. Select the frequency edit box and then turn the dial down to a frequency of 50 while pressing a note on the keyboard. You should hear the effect of the low pass filter. On the upper right part of the screen, you can see what the actual effect of the filter on the sound. 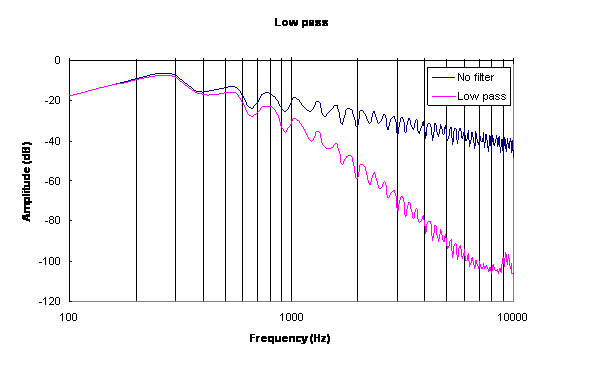 In the case of the low pass filter, you can see that all the frequencies above the filter frequency are attenuated. You can compare the original sound (original sound) to the low pass filter result (low pass filter). The following figure represents the sound spectrum. 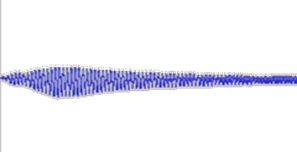 The x axis uses a log scale with gradations at 100,200,300,…,900,1000, 2000,3000,…10000 Hz. The y axis is graduated in decibels. Negative values mean lower amplitude (decreased sound). “No sound” would be rated as minus infinity decibels. 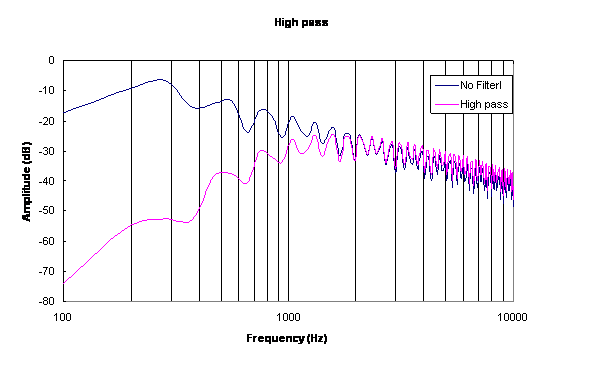 On this graph, the effect of the low pass filter appears clearly: all the frequencies above 400 Hz are attenuated. This filter has the opposite effect of the low pass filter. All the frequencies below the filter frequency are attenuated whereas all the frequencies above the filter frequency remain unchanged. 1) Select “High pass” filter on your M3 screen. You can compare the original sound (original sound) to the high pass filter result (high pass filter). On the graph below, you can see that all frequencies below 1000 Hz are attenuated whereas all the frequencies above 1000 Hz remain unchanged. 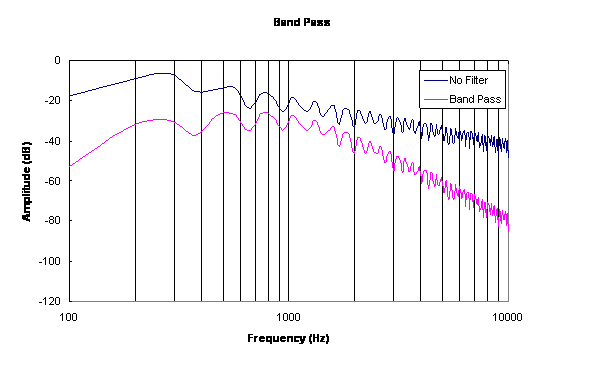 The band pass filter attenuates all the frequencies below and above the filter frequency. Only the frequencies close to the filter frequency remain unchanged. 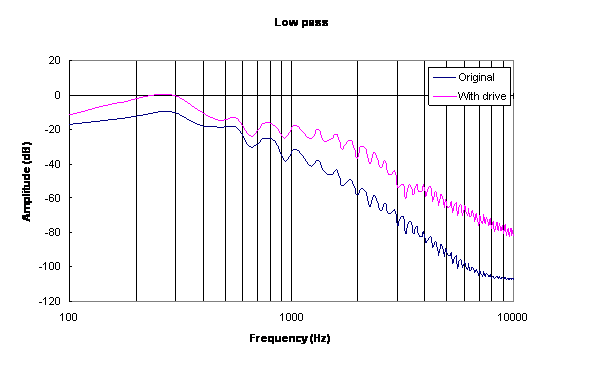 You can compare the original sound (original sound) to the band pass filter result (band pass filter). On the graph below you can see that both the low and high frequencies are attenuated. Frequency around 1000Hz are less attenuated than the others ones. 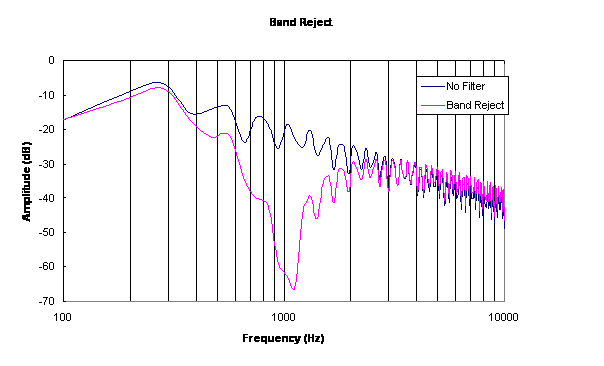 The band reject filter is used to remove some of the sound frequencies around the filter frequency. 1) Select “Band Reject” filter on your M3 screen. You can compare the original sound (original sound) to the band pass filter result (band reject filter). 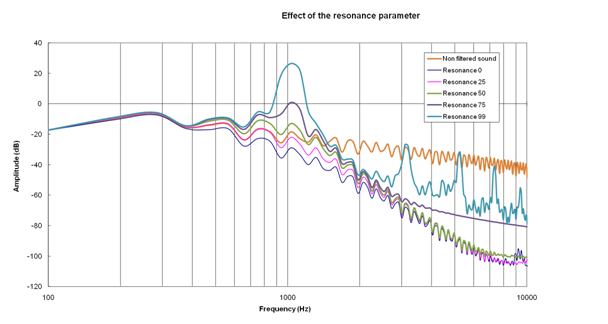 On the graph below, you can clearly see that all the components around 1000 Hz are attenuated. Using the recorded data (C4 note sample during 4 seconds), I’ve reconstructed the spectrum of the four filters. Due to computation artifacts, the curves are of course not representative of the actual filters behavior, but it gives an idea of what appends and what kind of “correction” is done by each filter. Most filters do have two main parameters. The first one is their natural frequency that determines which part of the spectrum is amplified or attenuated. The second one is the resonance that allows modifying the “shape” of the filter spectrum. 2) Using the dial, raise the “resonance” parameter from 0 to 50 while playing some notes on the keyboard. In the following table, you can hear the sounds obtained by raising the Resonance parameter from 0 to 99 by 25 steps. The spectrums of the different sounds are given on the following figure. 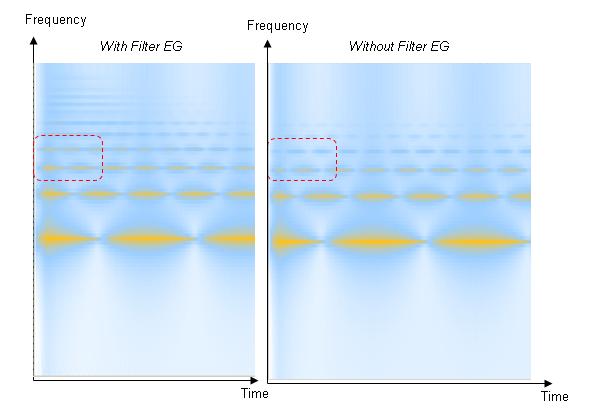 The higher the resonance parameter is, the more amplified are the frequency around the filter frequency. 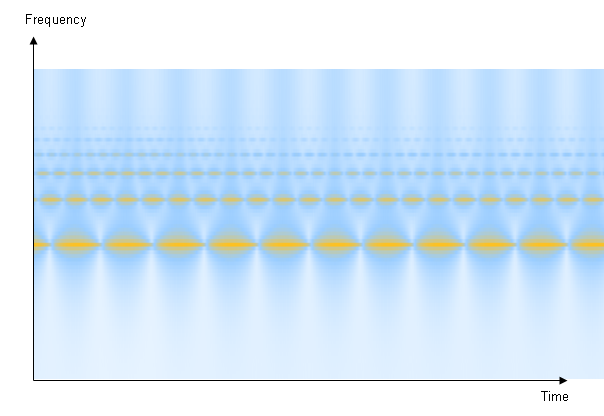 Notice the strange effect that appears for the 99 resonance. 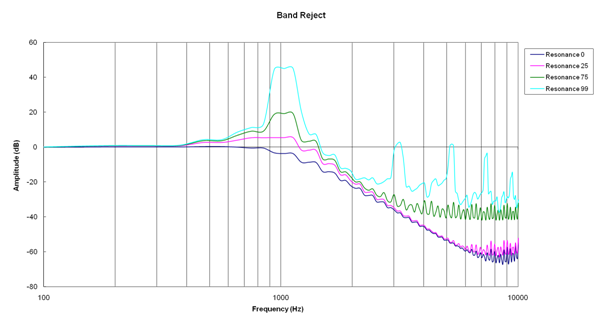 Finally, here are the spectrum of the filter with 50 cutoff frequency and different resonance settings. Before studying the amplifier section, we need to switch the second oscillator on and ensures that both filters are set to “low pass” with a 50 “cutoff” frequency and no resonance. 2) Select “OSC1 Basic” tab and ensures that the first oscillator is on (the red square close the sample label should be lit, if not touch the red square to turn it on). 3) Select “OSC2 Basic” tab and switch the second oscillator on by touching the red square. 5) Select “Low Pass” filter and set the “cutoff” frequency to 50 and resonance to 0. 7) Select “Low Pass” filter and set the “cutoff” frequency to 50 and resonance to 0. If you want to check the sound you should have at this point of the tutorial, check this file (filter final sound). As explained before, the filters allow adjusting the frequency components of the sounds. The amplifier is used to adjust the sound level. The interesting point is that the sound level can vary in time by using an Envelope Generator. 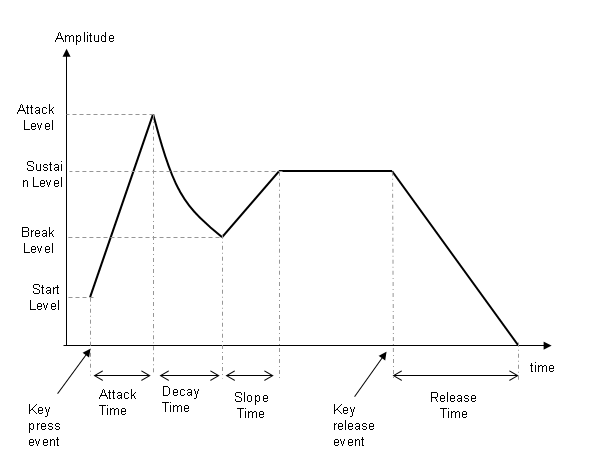 An Envelope Generator allows defining a “curve” (over time) that is applied to one or many parameters. In the Korg M3, the curves are spitted into 5 separate parts that can be adjusted individually. There are also 4 extra parameters, namely the “Curve Attack”, “Curve Decay”, “Curve Slope” and “Curve Release” that allow specifying the curvature of each segment. Our sound sounds a little “rude”, so we are going to arrange this by modifying the default amplifier envelope. That means that we are going to change the sound volume over time according to the specified enveloppe. 1) Hit the “Page Select” button and then chose “P4 Amp/EQ”. 2) Ensures that the “Amp1 EG” tab at the bottom of the screen is selected. 4) At the bottom of the screen, select the “Amp2 EG” tab. 5) Set the same envelope settings. Now, when playing some notes on the keyboard, you may notice that the sound has a smoother attack, and that the sound does not stop immediately after you release the key. The “sustain” lasts a little bit. This audio file (with and without envelope) contains the original sound and the same one with the proposed envelope settings. 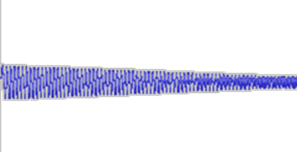 The figure illustrates the effect of the “Attack” settings on the sound. The drive parameter allows overdriving i.e. somehow “saturating” the sound to produce more “dirty” sounds. This usually makes louder sounds and on a frequency point of view, the drive effect adds some high frequency components to the sound. 1) Being on the “P4:Amp Eq” page, hit the “Amp1/Driver” tab at the bottom of the screen. 2) Set the drive effect to its maximum value, 99. 3) Hit the “Amp2/Driver” tab at the bottom of the screen. 4) Set the drive effect to its maximum value, 99. Now, you can hear the drive effect. On this program, there is not much difference, probably because the initial oscillator sample (saw tooth) is quite rich, i.e. it has already lot high frequency components. You can compare the original sound (original original sound) to the one with the drive effect at its maximum (maximum drive effect). As you can hear, the drive effect produces louder sound. The next figure represents the sound spectrum with and without the drive effect. You can see that the “drive” spectrum is clearly above the original one, i.e. all the frequencies have been amplified. 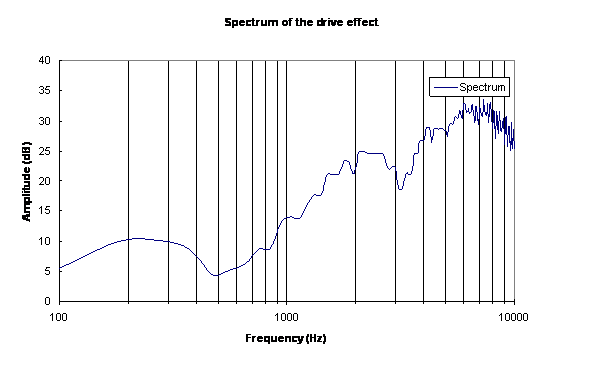 Next figure represents the "drive" effect spectrum. You can see that the low frequencies (0-1000 Hz) are boosted by a quasi constant 5 dB and that all the components above 1000 Hz have been shifted nearly linearly with their frequency. Now, let’s play with the "low boost" effect. According to the manual, this effect acts as a special equalizer that is parameterized by both the drive and “low boost” amounts. 1) Ensures you are sill at the “P4:Amp/EQ” page and that the “Amp2/Driver2” tab is active. 2) Put the “low boost” value to its maximum (99), and keep also the drive effect to its maximum (99). 3) Switch to the “Amp1/Driver2” tab. 4) Put the “low boost” value to its maximum (99), and keep also the drive effect to its maximum (99). Play a few note on your keyboard, you can hear that the sound is much “dirty”, the “drive” effect has been enhanced. 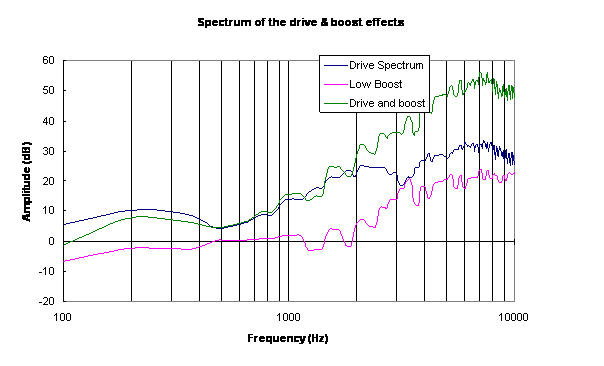 In this audio file (comparison of drive and combined drive/boost effects), you can compare the original sound, the “drive” effect, and at last the combination of the “drive” and “low boost” effects. Let’s see what happen to our sound using this “low boost” effect. The following picture clearly illustrates that the “low boost” effect produced a sound with significantly higher level in high frequencies. This is confirmed by the spectrum of the different effects shown below. The ‘Low boost” effect has lowered the level at low frequency but increased the level of higher frequency. The resulting effect “Drive and boost” allows a great amplification of the highest frequencies. We are not going to use any “drive” or “low boost” effect, so we are going to put them to 0. 1) Ensures you are sill at the “P4:Amp/EQ” page and that the “Amp2/Driver1” tab is active. Now you are ready for the next section. By the way, at this point of the tutorial, your program should sounds like this (sound check). Using oscillators, filters and amplifier envelopes give you some freedom in the sound synthesis, but this is clearly not enough to have fun… We need more tweaking possibilities. One of them is to vary some parameters over time. We could modulate some parameters using, for example, a sine or a triangle generator. Such generator is called “Low Frequency Oscillator”. We may also want to vary the parameters using an envelope generator. The Korg M3 offers you both possibilities … and much more. For this tutorial we are going to modulate the filters frequency. But if you want, you can modulate nearly all the Korg M3 program parameters. 3) Chose for example a “triangle” waveform and set its frequency to 12. 4) Select “OSC2/LFO1” and also chose a triangle and a frequency of 12. 5) Play some note on your keyboard… Nothing has changed ??? In fact, this is perfectly normal since this LFO generate a signal but this signal is not used yet to modulate any parameter. 8) Apply a +30 “LFO 1 intensity to A” to modulate the filter frequency by +30. This number allows specifying the amount of modulation. When LFO signal increases the parameter value increases by the specified amount. Negative values allow modulating on the opposite way of the LFO… (i.e. LFO signal increase lead to parameter value decrease). 9) Hit the “Page Select” button and select the “P3-2 Filter 2” page. 10) Apply a “LFO 1 intensity to A” of +30 to modulate the filter frequency by +30. Using this particular modulation, we can expect the frequency of the filter to be very low at the beginning (“poor” sound) then it will gradually increase, leading to a more “brighter”, “richer” sound, then go back to a low frequency and so on. Play a note and keep it pressed for a while. You should ear the sound changing over time. The filter frequency varies slowly, following the triangle LFO waveform. will be represented in white, medium levels in blue and most important level in yellow. So here is the original sound time-frequency spectrogram. Now let’s compare the sound after applying the LFO modulation to the filter frequency. The effect of the LFO appears clearly. What is ear is what you see !! Now let’s switch the LFO off for the moment in order to investigate another way of modulating parameters. 1) Hit the “Page Select” button and select the “P5 LFO” page. 2) Select the “OSC 1 LFO1” tab and check the “STOP” checkbox. 3) Select the “OSC2 LFO1” page and check the “STOP” checkbox. Each filter has also an envelope generator similar to the amplifier envelope generator. It allows modulating any filter parameters. 3) Play some notes the keyboard: again nothing happens because the envelope has been defined but it is not applied to any parameter. 4) Select the “Mod” tab. 5) Apply a +30 “Intensity to A”. 6) Hit the “Page Select” button and select the “P3-2 Filter2” page. 9) Apply a +30 “Intensity to A”. Play some notes on the keyboard, you can ear the difference. You can compare the original sound (without filter eg) to the one with the filter envelope generator set (with filter enveloppe). The following picture shows the spectrogram of the sound with and without the filter EG. When the Filter EG is on, as the filter is “more open” at the beginning of the sound, we expect its higher frequencies to have a higher level. 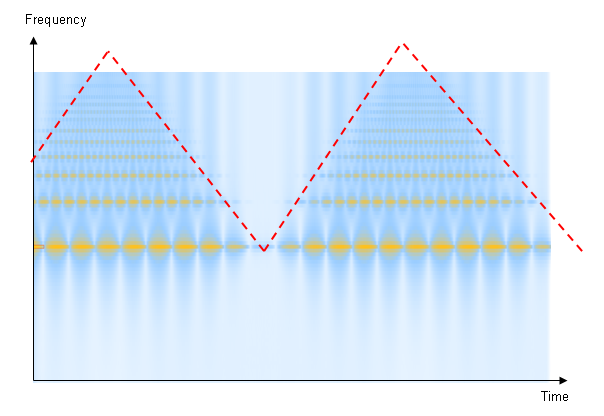 This effect can be observed by comparing the time-frequency spectrogram, particularly the area inside the red square. There is more “yellow spots” on the left hand part of the picture. This first tutorial was written in order to make you discover the basic elements that are used to produce sound with the Korg M3. I hope things are a little bit clearer now. The description of each element was quite incomplete since many of the parameters haven’t been investigated yet. Moreover we did not address many important topics yet (filter order, the effects section, etc) : we still have work on the way !! Now you know all the basic stuff to start sound synthesis. Remember, the best way to learn is to practice. Let’s time to tweak your M3… change the parameters, change the samples, modulation setting, and change the filters, experiments things… In other words, have fun with your Korg M3.